Mizuna is a Japanese mustard green with a mild, somewhat sweet flavor. It’s shape resemebles arugula, but with pointed, jagged edges on the leaves instead of round ones. It is used in mesclun salad mixes, stir frys and soups. In class this week, we used baby mizuna in an appetizer we prepared. It was dressed lightly with a grapefruit vinaigrette and plated in a nice bunch next to a fan of sliced scallops and a few ruby grapefruit sections. The bright greens, the ruby-pink fruit, and bright white scallops looked beautiful together. A dab of neon-orange fish roe was placed on the scallops to add another color and texture dimension. The concensus was that mizuna is delicious! Especially with the grapefruit vinaigrette. Maybe my new favorite salad green. It was not too fibrous or thick like baby spinach can be sometimes, and not bitter at all like arugula. It was perfectly delicate and the mildly sweet and tangy flavor was complimented by the slight tartness of the grapefruit vinaigrette. The Good: Low in calories, high in folic acid, high in vitamin A and carotenoids, high in vitamin C, and contains glucosinolates which are antioxidants that help prevent certain cancers. The Bad: While it may be present in your mesclun mix, it is a specialty item that can be hard to find on its own. Look at local farmers markets or markets specializing in Japanese foods. It’s season is May-November, but is hardy enough to be grown as a winter green in a seltered area. 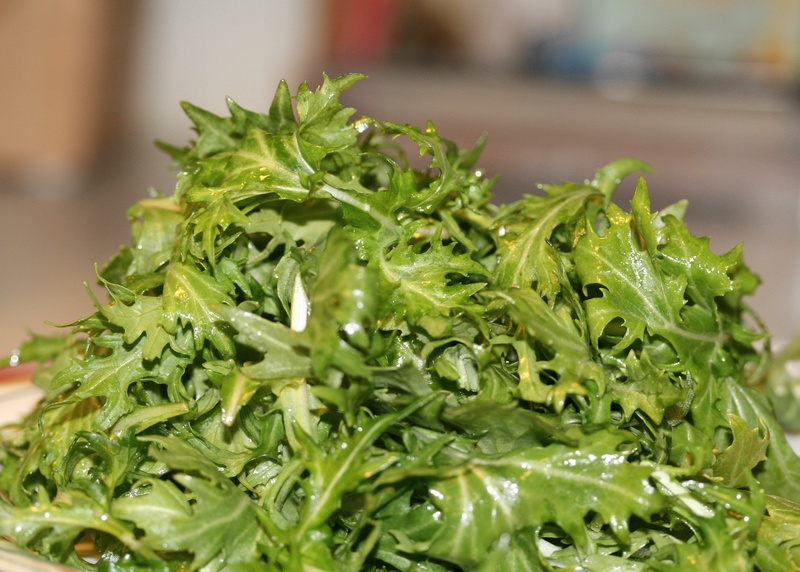 Recommendations: Like most dark leafy salad greens, mizuna is a nutrition powerhouse. It is a nice, mild green to incorporate into your salad rotation (in case you’re getting tired of the same mesclun mix, baby spinach, and leafy green lettuce). Try it with a grapefruit vinaigrette and you will add another punch of vitamin C. Also, It can substitute for any green in soups or salads.